Puerto Rico, as proven to all of you in my previous posts, is an amazing place; and the people are simply special. The weather is unique, the food is tasty and the beaches are beautiful and warm. I have also written about holidays, and Borinquen has a lot of holidays, like three or four times more than any other nation, and the longest Christmas season is here (without any snow). I have written a lot about different stuff, but its time to read about beauty and sports (weird mix right!). There have been six Ms. Universe winners from Puerto Rico and a few more were either first or second runner up (one of them from Cidra. Very proud I should add). But that is not the point. Boricuas are always happy to see one of them representing in a good way our Island and our culture. But every single year, we “know” the chosen lady to represent us in the Pageant is not the right one; she is either ugly, too skinny, too dark, too light, too tall, too small, hair is too long, teeth are too big, eyes like owl’s. And on top of that she will never make it to the top 10 and she’ll be lucky to be in the top 15. “Are you out of your mind? She’s the worst ever”. But deep inside we want that ugly, too skinny lady to win. That’s why every single year we tune in to see her, and all the others, walk and model all night. If she does not make it to the first 15, we knew it was going to happen. “I told you she is ugly. Miss other town was better, I told you”. But when she makes it, we also knew she could do it. And then the last 10, last five, last three and of course “Ganó, sabía que ganaría” (She won, I knew she would win). And we jump, scream, compare her to the ugly lady from the ugly country who was the first runner up, and we make sure to be at the airport when she arrives. We close streets and we celebrate for five or six days, and we get ready for next year’s ugly lady. Now some sports. Boricuas love sports; baseball, basketball and boxing. We are now getting into futbol (soccer, for some of you) and some Mixed Martial Arts. I have been to some basketball and baseball games and it’s really amazing to see what happens there. It’s not just about the actual game, it’s about the fun. First, we have three or four guys making sure the rest of the stadium crowd is pumped. One has a trumpet, another has “la clave”, one drum and the last man is the loudest in the whole place, he just screams his lungs out with some melody and we all follow. The worst time is always for the umpire or referee. Boricuas will let him know that his wife is cheating on him, that he was born with no father and his mother works the night shift at the street (I know it’s wrong, but it is how it is). You think all of that happens when Boricuas go to a game? Watching sports in someone’s house is also an adventure. In the morning we go to Costco or Sam’s to get some beer, some meat for the grill and some more beer. At boxing time everyone is in front of the TV, some sitting, some standing (some are too nervous to sit) and everyone is a boxing expert. Showtime people are no good, and the Spanish commentators are always against our fighter. The bell rings and the fun starts. From the kids to the elders, we watch that fight as our lives depend on it. Punch after punch every Boricua is screaming or throwing punches in the air. “Dale nene, dale. No te dejes dar, muevete! (Go man, go. Don’t let him punch you, move!) with the ocassional coño and carajo. When Tito Trinidad was boxing, that night was amazing, the whole Island, and every Boricua outside of it, was ready. Even crime took the night off to celebrate his fight, because everyone knew he was going to win (we would see aliens before we saw Tito loose). It was even better when he was interviewed and not even the interpreter could explain in English what he meant: “Did you think he was going to knock you, Tito?” said the PPV guy. “A la verdad que no por que yo sabia que estaba cansao y que el cuerpo no le daba pa mas na. Lo vi cansao y decidimos ir pa encima a terminarlo.” Said Tito in his faster than usual Spanish. That was the hard part for the interpreter, putting some sense to those words in English when he could not even follow him in Spanish. “I was ready and I knew I would knock him out”, that’s all he could understand. There has been some incredible days in basketball too. 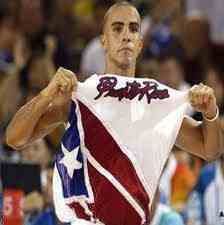 Carlos Arroyo’s celebration in the court when Puerto Rico beat USA in 2004 (one of the few suffered by the USA Olympic team. YEAH!!!!!!!). When Jose Juan Barea, of the NBA Dallas Mavericks team was killing the LA Lakers. He was so good that even the Lakers’ fans wanted Dallas to win (I just made that one up) and so many others. Even in MLB and NFL Boricuas make a difference (even Victor Cruz dancing some salsa after a touchdown). Roberto Clemente, los Alomar, Edgar Martinez, Carlos Delagado, Carlos Baerga and so many others that played the great game of baseball made every single Boricua proud. Don’t let the size of our Island fool you. Puerto Rico is full of great men and women that will go the extra mile just to prove you wrong. Not only in Beauty Pageants or sports, also in music (Ricky Martin), Hollywood (Benicio del Toro), space (Joseph Acaba), politics (Sonia Sotomayor) and blogging (me, of course) there is always a Boricua proving that there is no big task that we can’t do, and we do it better, always! Until next time, cojanlo suave! We all have family. Parents, brother or sister, uncles or aunts, and cousins (even those you only see in funerals or weddings). I’m sure that many of you reading were taught to respect your family and to address them in a good manner. That’s where the word Bendición comes in. When I was a kid, my parents taught me that when I saw one of them or my uncles and aunts I had to ask for their blessing; that’s the meaning of Bendición. Usually after that “asking for a blessing” the answer we got was “Dios te bendiga” or “God bless you”. In my parents’ case, we were required to ask for that blessing in the morning, before we went to bed and, in case we were not together during the day, whenever we saw each other. In Puerto Rico, at least while I was growing, that was a normal thing. We did not see it as something that was forced into us, but as a way of respect towards or family. I have always said Boricuas are unique, and no one can fight that argument (don’t you dare fighting that argument). When we speak of family there’s more to that word than your parents, their brothers and sister their children. Even your best friend’s parents are family, or that neighbor you’ve had for the past 20 years. That same neighbor that looked after you when your parents were out or working. I remember some friends asking me why do I have so many aunts. “She is not my aunt, just a neighbor”. To this day I have an aunt and an uncle just because when me and my brothers were kids we spent a lot of our time with their children, who are now (and have been for the last 20 years) our cousins. That aunt and uncle are even my kids’ (and we are not remotely related, they were just my neighbors). The same thing happens with my kids and my friends: Tio Flipe, tio Will, tio Jose, titi Noe, titi Jackie… just friends that are so close that they are family now. And my sons ask for La Bendición with the same respect they ask my parents. And I know all around the Island and with most Boricua families the story is the same. “That’s part of the blessing of living in this Island; the concept extended family has a whole new meaning”. Those are words from my extended family member Mari, who gave me the idea to write this post. Her father studied with mine, her older brother studied with mine, the one after that studied with me since kindergarten and he was born 2 days before I did…u get the point, we are family. Also every Boricua, and I really mean EVERY, have at least a cousin either in New York, New Jersey or Florida (we are everywhere). Brooklyn, Bronx, Newark, Orlando, Tampa, just some of the cities in which our family members are. I even have family in Utah freezing their butts for 9 months of the year. All of us have family members in those cities and in some cases, we have not even met, but our parents say they are our family members and we just believe them. Something else that even I find amazing is La Pinta (and I don’t mean Christopher Columbus’ ship). The town where I was raised in, Cidra, is not the metro area of the Island. Is a rural town and there was a time when my parents were growing up that pretty much every one in the town knew each other. Once when I was having lunch in some local place and this lady, around her 60’s, who I did not remember meeting before, walked up to me and asked if I was Juan’s son. I replied with a yes and she said: “te saqué por la pinta”. I just laughed with her, but I did not understand what she meant (I did not want to be disrespectful, you know). I mean, I did not know any pinta (Boricua for red haired with freckles). Later that day I learned that what the lady meant was that I look like my father, who she has not seen in a while, but he looks like his father (my grandpa). That’s the definition of “La Pinta”, that you and your father or mother, sometimes uncle or aunt, look alike. The definition of that saying may be new to some of you Boricuas reading, but in the towns in the center of the Island is a common thing to this day. Now you know the importance of family for us. Is not the blessing of having parents and siblings; for us “familia” is a huge word that carries some degree of trust and, of course, love. And that also means love for our Island and our people no matter what part of the word we may be in. To my parents, Bendición. And to all of you, cójanlo suave! If you have an idea for my next post, let me know. Remember to share this with your friends, family and colleagues, and to leave a comment if you like. There’s nothing better than a Boricua party! Have you ever been to a Christmas party in February? Or maybe to a welcome Christmas party in October? If your answer is NO you are either living in the wrong part of the world or you need at least one Boricua friend. Puerto Ricans love to party and there is always a reason or an excuse to do it. 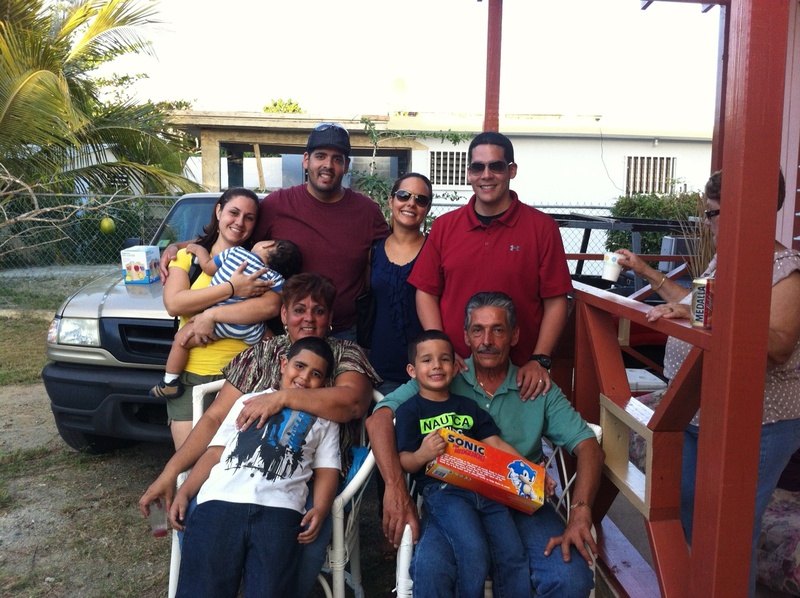 Boricuas start Christmas time around Thanksgiving, most of the time at the beginning of the month. Before we even buy the turkey, we already have the tree tied to the top of the car (and we brag about if on Facebook). And as I said, that’s just an excuse to start dinner parties, and sing, and drink and eat all the food I talked about in my last post (awesome food I should say). In Puerto Rico we have the longest Christmas ever. Let me break it down for you: we start in November, we have some turkey with mofongo (and next day some turkey sandwich and depending of the leftovers some turkey soup). We move on to December, when we start waiting for the 25th with some music and food, of course. We say hi to baby Jesus or Santa (two different things, but kids are happy so…) and we wait for the New Year. We start blowing firecrackers a week earlier (we have to make sure they work) and we drink some Pitorro (in this blog I learned how to add hyperlinks. I am improving). We say goodbye to Mr. Old Year and welcome the new one singing and eating and drinking. In some cultures, that’s where it ends. Not here my friends; in Puerto Rico we also wait for los Tres Reyes Magos (The Three Wise Men) on January 6. We want to extend it a bit more, so we have Octavitas (eight more days of Christmas time). Everything is supposed to end there. But why finish the holiday season in January when we need to party longer! To be serious, and that is something that rare in me, I thought the Christmas season was over after that. 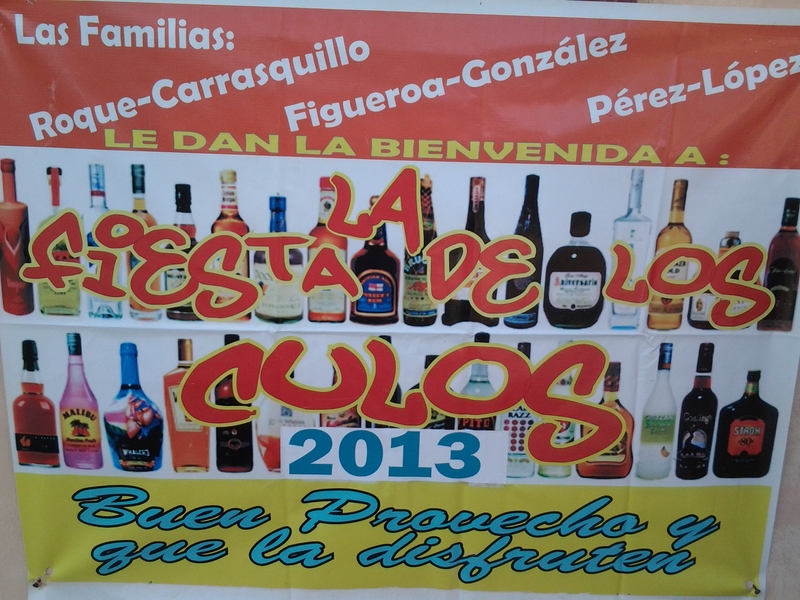 Last Sunday, February 10, 2013 I was invited to a peculiar party with my family and friends: La fiesta de los culos (I don’t know how to translate that, really). This event marks the end of the holiday season, in February. Do we really have to extend it that long? Of course we do!!!! People bring whatever was left from Christmas time and there is also live music, Puerto Rico music. I was amazed on how many people were there eating some arroz con gandules, lechón asao’ and all the drinks around. And you know why it was done in February? Because Passover is just around the corner (you know, we have to take a break sometime). That is when Puerto Rico, or at least the people that was there, finish that Season. But there is more to come, of course. Summer is just around the corner, and Boricuas get ready on Semana Santa (we take Good Friday off, because we need to be thankful – AMEN). Now the beach starts to be packed with awesome bodies, regular ones and some not so pretty, but all happy, of course. Summer is awesome, great weather, we celebrate the Independence of every other country, we move later to Labor Day and we start to get ready for Christmas again (it’s a wonderful circle type of thing). In baseball or basketball games Boricuas also party. In the United States, for example, in a college game you have the band, 15 or 16 guys with weird outfits parading all around the field while playing with their instruments. Not in Puerto Rico! Here you have one guy with a Pandero, another with a whistle, the other one with a trumpet, and those three guys know how to get everybody in the stands screaming and singing. Those three guys will be drunk in about two hours and they play better than before (can you band guys do that? I dare you). And when Boricuas travel together, party rides along. Have you been waiting to ride a rollercoaster in Disney and all of a sudden you hear some guys singing and screaming? Most likely, those are Boricuas. They make any ride worth waiting for. And they make the party right there with no instruments, just clapping. Being Boricua means to be happy, every time. And we love to share that happiness. So, if you are here during Holiday season, or any time, and you find a party around, make yourself part of it. If you are somewhere around the world and are bored or sad try to find a Boricua and I guarantee there will be some party around to go to. Enjoy the time and laugh, dance, eat and drink; you will have a great time. Remember to share this post and to comment on it too. Until next week, cójanlo suave! PS. 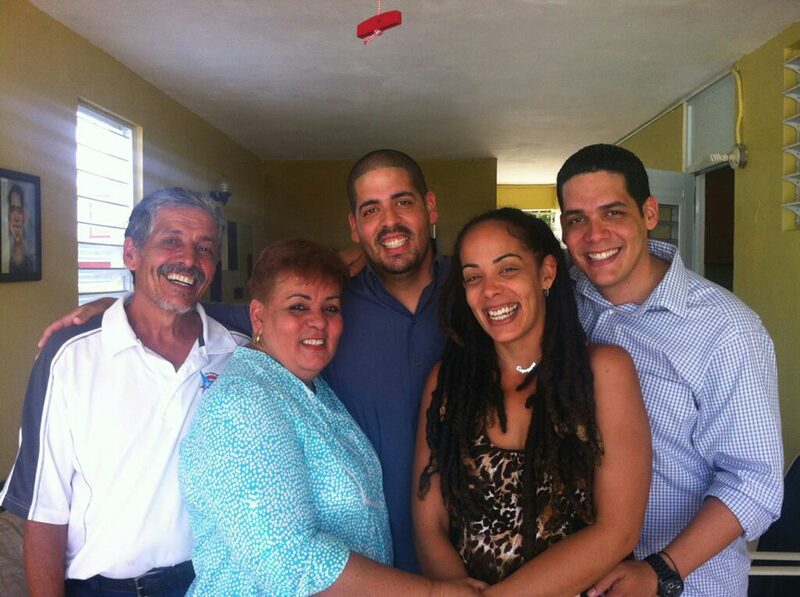 Here’s a picture of me and part of my family (only my sister is missing) in La fiesta de los culos. We had a great and relaxed day. Love you all (including my sister)! This specific post may serve two purposes. First, if you enjoyed the adventure trip to Puerto Rico and are looking for something criollo (native to the Island and our people) to eat, this will help. And second, if you don’t know where to travel when time and money allow you to, the food issue will have you flying to Borinquen. Our food, as every place on this planet, is unique. The way it’s cooked, the taste, the look and the taste (yes, I said it already, but you have to understand it tastes great) makes our food one of a kind. There’s food that we eat all year ‘round, and there’s other that we eat more during the holidays. The seasoning is one important part of our cooking. We don’t just add a little of salt and a little of pepper. We have specific seasoning or adobo (this is when I start with names of stuff in Spanish, so be ready for more) for every food. And what makes anything great? Sofrito, a mixture of herbs and stuff… (bottom line, sofrito is great, Google it if you need more info). That’s one of our secrets that every one knows about. Rice with beans, add some sofrito. Rice with chicken (arroz con pollo, my moms best dish), of course there is sofrito in it. And so on with many of our dishes (now I’m craving arroz con pollo). Let’s pretend for a second you arrived to Puerto Rico and are hungry. You could eat some BK, or Mickie D’s, or the red-haired girl with pony tail (and YES, we have those “restaurants” here too) but you want to taste some awesome food. “Where should we go?”, you ask your friend. The answer, Piñones! A place in Carolina really close to the beach, near the Aiport, where greasy, tasty food is served. Seafood, land food, pinchos (Shish Kabob, but tastier) and mofongo (fried plantain) is in every menu. 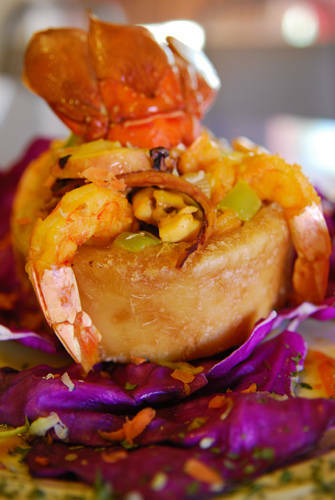 Let’s take a minute and explain mofongo to you. One of my friends from Washington, DC tasted mofongo once and said it tasted like potato. We did not like that comparison (really, potato? ), but we understood that we have to compare new food to the one we already know. Some mofongo with chicken or shrimp, served in a pilón (once again, Google it) or served plain with some steak and mayo-ketchup (that’s an easy one, c’mon). Mofongo was made on the third day when God wanted some great food, really (it’s a joke. I hope no one gets offended)! We can spend this whole post in Piñones, but we have some other places to go. Enough mofongo for now, lets move a little bit to the center of the Island (I will only read this post once since is making me hungry), Cayey. 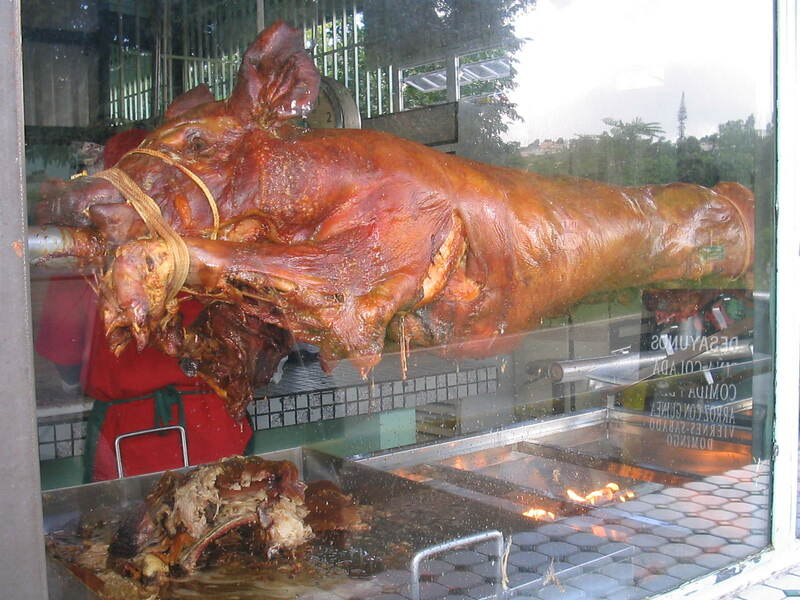 There is a part of the town of Cayey known as Guavate where the main attraction is rotisserie pork (lechón asao’). It’s a pork, a full grown pork… here’s the picture, it’s easier that way. And it’s served in many different ways: with some tostones, guineos, or some rice with pigeon peas (arroz con gandules) and morcillas (this is one you have to Google because I refuse to explain how it’s done). And make sure to get that down with some beer, juice or water (even the bottled water is great). That’s not even where the fun is. Guavate, other than the food, has a great atmosphere. There is always music everywhere, people are always happy and there is someone weird enough to make you have a good time. You will see people in Jeeps, some will arrive in horses (a lot of people will arrive in horses), but what is sure is that you will have a great time on a great weather. I can go on, and on, and on (you get the point) about the food of Puerto Rico. But this blog will not be enough to cover it all. Just remember to ask the locals when you travel to the Island or your Boricua friends to cook something for you. You can ask for alcapurrias, bacalaitos, mondongo… If you what to eat some Christmas specials (other than arroz con gandules), ask for some pasteles (that is not cake in Spanish), tembleque, arroz con dulce, and a whole lot of stuff that we eat and prepare fried and with love (no other combination is better). Feel free to share with us some other food that I know I missed in this post, or foods that you cook in your culture or family. Remember to share this post and, if this is the first one you are reading, check my first two posts and share them too. I have no idea what I will write about next time. But knowing us Boricuas, there is a lot to tell. Until then, cójanlo suave (you should know what this means)!